Children play outside a house with identified lead hazards Wednesday, August 16, 2017, in Cleveland. The house was one of nearly 90 in Cuyahoga County for whom the Board of Health has issued Orders of Eviction. The identified houses were noncompliant with lead abatement, a process triggered once a child staying at the residence tests positive for elevated lead levels. A neighborhood is reflected from the porch of a house with a posted Order of Eviction Tuesday, August 15, 2017, in Cleveland. The owner of the house was noncompliant with lead abatement ordered by the county health department, a process triggered once a child staying at the residence tests positive for elevated lead levels. Allyse Goolsby discusses the lead abatement updates she and her husband had made to their new rental property Wednesday, May 3, 2017, at their home in Toledo. The house is one of 27 in Toledo whose residents have been given orders to vacate by the Toledo-Lucas County Health Department due to ongoing excessive lead contamination. Ms. Goolsby and her family had moved into the property about a month earlier and were unaware of the eviction order. She said they had preemptively been working to renovate the home and abate the existing lead issue in hopes of buying the property. Malik McClure, 9 , shows the scars he bears as the result of a full-body rash his mother Dequindre Winfrey, of Flint, said he and his four-year-old sister contracted because they drank tainted Flint municipal water. Malki's family attended a town hall meeting Saturday, February 6, 2016, at Foss Avenue Baptist Church in Flint, Michigan, to speak with a delegation of state and federal elected officials. "It wasn't until my own hair started falling out that I connected it with the water," Dequindre Winfrey, Malik's mother, said. "You're supposed to protect your kids and I didn't. I feel like this is my fault," LaToya Jenkins, 43, said of learning the home she rents in Toledo is contaminated with lead paint. Ms. Jenkins spoke Friday, January 26, 2018, about her attempts to find a new place for her family to live, though she said that had proved difficult. Often, landlords didn't want to rent to her after finding out she knew about Toledo's new lead abatement law. In the meantime, Ms. Jenkins and her twins, two-year-old Floyd Benion Jr., left, and Nadia, right, are trying to avoid any more lead exposure in their home. Floyd, who has Down Syndrome, tested positive for elevated levels of lead in June of 2017. "I don't know what I'm going to do. Lose my home and stay in the street?," Larry Oates, 61, a retiree from Jeep asked of the vacate order he received from the Toledo-Lucas County Health Department Tuesday, May 16, 2017, at his home in north Toledo. "I'm just tired and I can't afford to fix this." Mr. Oates said he absolutely thinks homes where children reside should be treated for lead, but that the health department's investigation at his house was triggered by a child who was living there without his knowledge several years ago. At the time Mr. Oates says he was renting the property out, though now he resides there. The child has long since moved away, and Mr. Oates said he was unaware he was considered in non-compliance with lead abatement. Now on a fixed income, Mr. Oates is concerned about how he is going to pay for potential lead abatement and frustrated that he wasn't informed by the health department before they fixed a sign to his front door. He says as an adult he isn't suffering any ill effects of lead. Residents of Flint, Michigan, pick up cases of water from a distribution center at a Fire Station Wednesday, January 20, 2016, in Flint, Michigan. The city of 99,000 people is facing an ongoing water crisis after high levels of lead were detected in drinking water across the city. Each person is limited to one case of water per day. Darryl Matiere Sr., an Air Force and Air National Guard veteran, emphatically denounces Michigan's Governor Rick Snyder to fellow Flint resident Audrea Crawford (not pictured) after both came to one of the city's fire stations to pick up a case of bottled water Wednesday, January 20, 2016, in Flint, Michigan. The pair said they felt no one had been held accountable for the mass lead poisoning. Flint resident Audrea Crawford holds out her city water bill after stopping at a distribution site to pick up a case of bottled water Wednesday, January 20, 2016, in Flint, Michigan. Ms. Crawford says her bill of $428.81, which was due on December 21, 2015, is far too high for water that cannot actually be used. Angela Williams holds her daughter Angelina, 2, as she expresses her concerns about lead paint in her rental house Tuesday, August 15, 2017, in Lakewood. Their home was one of nearly 90 in Cuyahoga County for whom the Board of Health has issued Orders of Eviction. Many rental properties continue to be leased to new tenants despite the orders of eviction and abatement, often leaving new residents vulnerable to lead poisoning or homelessness if they are removed from the property suddenly. Flaking paint in a windowsill would be flagged as a potential lead hazard in a rental home June 22, 2017, in Rochester, New York. The city of Rochester inspects all rental homes for, among other things, potential lead hazards. Inspectors perform visual inspections and, in areas of the city designated high-risk for lead poisoning, also administer dust wipe tests. Flaking paint, dust, and soil around houses with wooden siding are common sources of lead exposure. "I'm really worried now," India Gaston, 15, said as she held up her three-month-old son Ozzie Banks Wednesday, May 3, 2017, at their rental house in Toledo. Ms. Gaston said she and her parents, with whom she shares the rental house, had no idea they were supposed to vacate the property because of lead contamination. Though her niece had tested positive for lead when she was living at the property three years ago, India was under the impression that issue had been resolved. Velma Rollins has kept records of her struggle with the Cuyahoga County Board of Health. She has lived in her house off and on since she was a small child and has raised children and grandchildren there. Now, her son owns the property and the pair have struggled to sort out the Board of Health's ordered lead abatement, which was triggered after Ms. Rollins' grandson tested positive for elevated levels of lead. Their house was one of nearly 90 in Cuyahoga County for whom the Board of Health has issued Orders of Eviction after noncompliance with lead abatement. Low-income owners often struggle to pay for the ordered abatement. Jeremiah Slaughter, 5, left, plays on the front porch of his grandmother's house Wednesday, August 16, 2017, in East Cleveland. His grandmother Brenda Slaughter, right, said her family was moving out of their rental property after nine years because their landlord hadn't complied with ordered lead abatement. 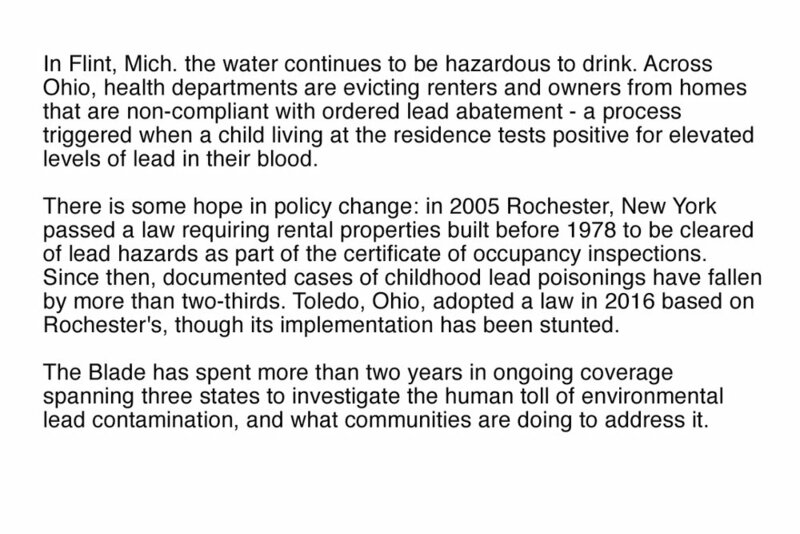 Because lead is present in virtually all homes built before 1978, when lead in paint was outlawed, many low-income families end up moving from one rental with lead hazards to another. "It's a scary situation," Mesha Wallace said as she held her granddaughter Mariah Gaston, 3, Tuesday, May 9, 2017, at their home in South Toledo. Mariah was diagnosed with lead poisoning at 1 while living with Ms. Wallace in the home they rent. Mariah was treated, and the family's landlord repainted the interior of the house. Ms. Wallace was alarmed to learn two years later that the Toledo-Lucas County Health Department had included her home on a list of houses unfit for human habitation due to lead contamination. With another grandchild, three-month-old Ozzie, living in their home Ms. Wallace said she had started working 60 hours a week in hopes of saving enough money to move. She is now having her three children and two grandchildren tested for lead. Mariah Gaston, 3, played with the security door at her grandmother's house in South Toledo. Mariah was diagnosed with lead poisoning at the age of one while living with her grandmother Mesha Wallace in the home the family continues to rent. Ms. Wallace said she had started working 60 hours a week in hopes of saving enough money to move. She is now having her three children and two grandchildren tested for lead.